Every time I get on a video call, I chuckle over the old joke about news anchors never wearing pants behind the news desk. Jokes aside, using video to communicate during a virtual training (vILT) session is one creative way to keep learners engaged. Add various multimedia elements. Don’t get locked into just a slide deck! Add video and audio clips, infographics and animations, mini-games, fun and relevant polling questions, etc. Use video. The facilitator, as well as willing participants, can tune into a vILT session using video in addition to audio. Seeing the facilitator helps participants make a better emotional connection, which, of course, enhances learning. And, as noted earlier, everyone would only need to be groomed from the waist up for the session! Feeding pertinent questions and comments to the facilitator. Questions and comments are kept relevant and on topic. Dealing with any technical or other challenges offline. How many times have you had to keep the group waiting because one person had trouble logging in? Use of break-out rooms. Depending on the delivery platform, facilitators have various options for breaking a large group into several smaller ones to work on activities, brainstorm, etc. Schedule creatively. Who can really focus during a half-day VILT session? With a series of shorter sessions, there’s a better chance of holding the attentions of participants. Additionally, participants will have a chance to “marinate” on the content and will likely get more out of subsequent sessions. Schedule sessions in one-hour segments over a designated period, like meeting once a week at the same day and time. Assign easy “homework” between those shorter sessions. This could be as simple as having learners list at least one takeaway from the session that can be immediately implemented on-the-job. Participants have the option of sending their thoughts to the facilitator. Sharing these takeaways is a fantastic way to kick off a session and provide a review from the previous week. Throw in a few relatable jokes or personal anecdotes. Unique stories on the topic at hand enhance memory and help make a connection. These are just a few techniques I have used over the years in vILT sessions. Get creative! 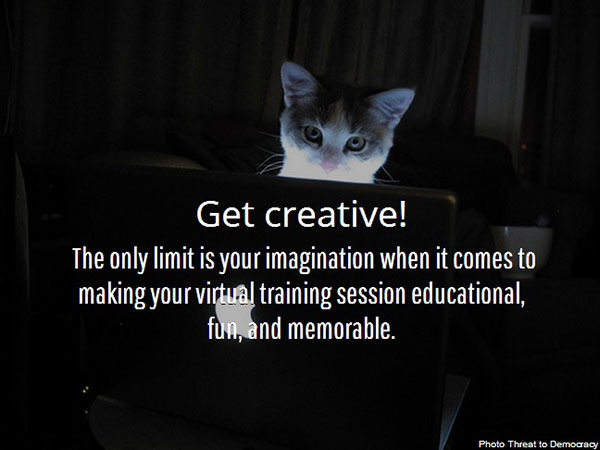 The only limit is your imagination when it comes to making your virtual training session educational, fun, and memorable. Catherine Davis is SweetRush’s Instructional Design Practice Lead. 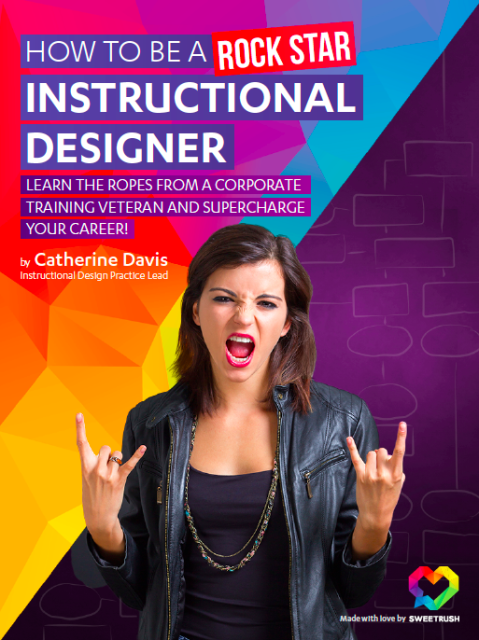 You can read more strategies and tips from Catherine in her free eBook: How to be an Instructional Design Rock Star: Learn the ropes from a corporate training veteran and supercharge your career!